On Saturday, hundreds of people left their DSLRs at home and headed to San Francisco with only their iPhones (and creative juices) for the 1197 conference. The one-day event was hosted by design firm Bolt Peters and digital publishing service Blurb; and according to the hosts, 1197 was the first conference devoted to mobile photography. While some still scoff at the importance of iPhoneography and its ilk, this group celebrated the medium with in-depth workshops and lectures. Philippe Kahn shares his inpiration for creating the camera phone. The most significant theme throughout the day was the importance of sharing, whether with friends and family, fans and followers, or the public at large. "It's about communicating," said Philippe Kahn, the creator of the first camera phone, during his talk. "Instant sharing is what drove us to create the camera phone. That was the beauty of it." 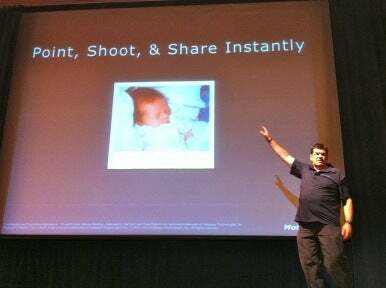 Kahn shot the first camera photo on June 11th, 1997, of his newborn daughter. (The conference was named after the date this photo was taken.) Wanting to instantly share that moment with his friends and family was the inspiration behind creating the camera phone. Fast forward 14 years and every smartphone is decked out with a multi-megapixel camera; Apple's newly released iPhone 4S makes photography a central component of the device; and photo sharing app Instagram has reached more than 10 million users. Jessica Zollman, the community evangelist for Instagram, spoke about the importance of mobile photography, citing sharing as one of the most important features. "We have seen photos [on Instagram] coming in live, like for Occupy Wall Street. It's happening for historical events," she said. What makes mobile photography so compelling is that anyone—whether they have photography training or not—can use a camera phone; and that so many people carry this device with them at all times. "[Mobile photography] further democratizes the medium," 1197 attendee Michael Martin told Macworld. Conference speakers agreed with that sentiment. "The camera phone is the tool for citizen journalism for the 21st century," said Kahn. "This is the medium for Mr. and Mrs. Everyone." 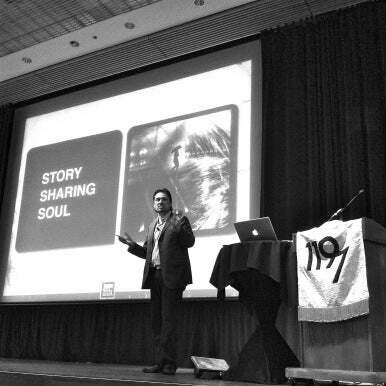 Richard Koci Hernandez talks about visual storytelling. Indeed, most attendees were not professional photographers, and while the speakers ranged from hobbyists to professionals, everyone seemed to be on an equal playing field with their camera phones. Richard Koci Hernandez, an Emmy award-winning photographer and a professor of journalism at UC Berkeley, and Dan Cristea, a graphic designer, held a workshop on visual storytelling. "The tool is irrelevant in some sense," Hernandez said. "What survives is our vision." The two often pointed out that it didn't matter what you knew about photography or photo-editing—the fun is in playing around on the device and with the different apps. And while the conference had its share of the philosophical, it was not lacking in the technical, especially when it came to iOS apps. Hernandez and Cristea demonstrated how to edit photos through app stacking—using more than one app to process a photo—blending, and more. Dan Marcolina, the author of iPhone Obsessed, shared his techniques for turning photos into sketches and paintings; and Dan Rubin clued attendees in on his minimalist process of making photos. Some clear app favorites among the speakers included Filterstorm, ProCamera, Lo-Mob, Decim8, Lithogram, Cross Process, and of course, Instagram. The iPhone (only one of many camera-equipped phones) was the clear winner of the day—most 1197 speakers and attendees owned iPhones, and admitted that it is their most frequently used camera. In fact, when one speaker asked the crowd who didn't use an iPhone for mobile photography, less than half a dozen hands went up. Attendee Cheri Fulk, who received her degree in photography, says she usually carries around her iPhone and another camera, yet still takes more pictures with the former. "I like the immediacy and flexibility of [the iPhone]," she said. Perhaps the most profound talk of the conference came at its end, from photojournalist and 2010 TED Fellow Teru Kuwayama. Kuwayama took his iPhone 4 to Helmand, Afghanistan, to cover the lives of U.S. Marines at war, and mostly used the Hipstamatic app for photo processing. "A lot of people reacted badly to it, saying that it was degrading and offensive to photography," Kuwayama said during his talk. But for Kuwayama, the choice was both practical and a way to bypass mainstream media. 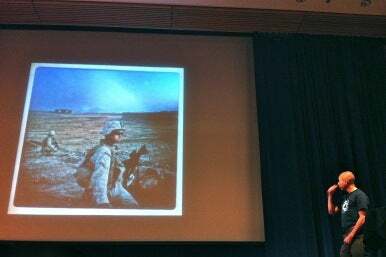 Teru Kuwayama shows one of the photos he took in Afghanistan using the iPhone. In fact, Kuwayama has never used his iPhone to make a call. "The touchscreen is more dustproof than any other camera I've seen," he said. Because of that and the iPhone's size, it was the best cameras for him to use while in the Afghan deserts. The photos were a part of Basetrack, an independent civilian media project that uses social media to share news and photographs from Afghanistan. Many of the Hipstamatic photos appeared on Basetrack's site and Facebook page. "It became a social support network, especially for the moms and wives of the soldiers," Kuwayama said.